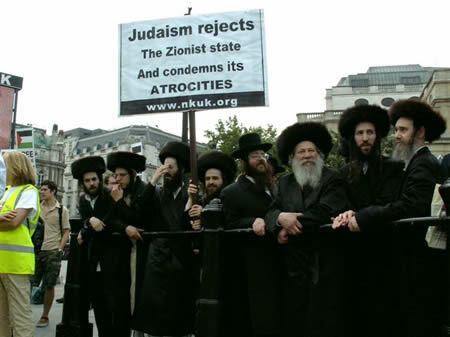 Anti-Zionist Orthodox Jews and supporters of the Neturei Karta in the U.K. joined in a demonstration held in Trafalgar Square, London protesting the "state" of Israel, it's atrocities and oppression for over half a century. With G-d's Help, A Saloom Aleikem. In the name of Torah Jewry throughout the whole word we declare our solidarity and sympathy with the Palestinian people. Torah Jewry decries and condemns the Zionist oppression and subjugation of innocent people and the brutal theft of their land. It has been forty long years since the occupation of Jerusalem and fifty-nine since the taking of the entire Palestine. The Zionists who have discarded G-d and His Torah have no right to speak in the name of world-wide Jewry. 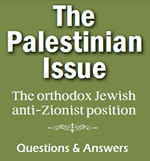 They have usurped the name of "Israel" and thereby misrepresent the true Jewish people. Torah-true Jews have never recognized the Zionist state, and never will! Why do you rebel against G-d Who sent us in exile and has forbidden us to return and to establish a state? You disgrace the name of the Jewish people! Torah-Jewry, faithful children of the one G-d, accepts His decrees and will not try to escape them by force. We firmly believe that revolt against G-d, evil and oppression of innocent people, will never succeed! The Zionist entity cannot endure. We hope and pray for a quick and peaceful dismantling of the Zionist state. We hope to live together in peace in the Holy Land under a Palestinian rulership of the entire land. Ultimately we pray for the revelation of the glory of the Almighty when all humanity will serve Him together in harmony.Â Amen.